It looks like Katsuya Terada, the Mangaka behind Monkey King and character designer for Blood: The Last Vampire, flexed his artistic muscles this past weekend at the J-POP Summit in San Francisco. 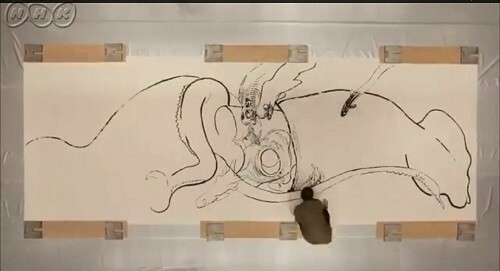 In spectacular fashion, Terada ended up painting a life-sized Giant Squid using actual squid ink. Check out the short video showing off his breathtaking work after the jump! After watching the video below, it is hard to not be impressed by his work. I mean, just the sheer size alone of this project is a daunting task to keep everything proportioned (even with the help of a monitor). But of course, he makes it look easy. The roughly 26 x 9 ft mural ended up being displayed at Ueno Station Hirokoji. For those of you interested in this kind of stuff you can also check out the mural he did in a live demonstration in May at for the Kytoto International Manga Museum here. I don’t know about you guys but I always find this kind of work so amazing. I can’t wait to see what Terada works on next!